So, my local yarn store is having a huge sale on a bunch of discontinued yarns, which is great because some of them are super nice and cheap, and terrible because I know that they won't be available for long. 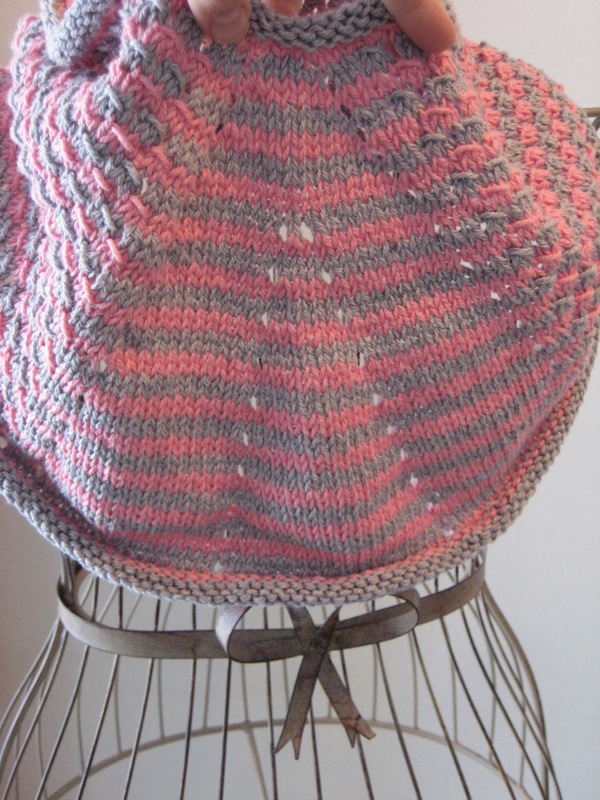 However, the yarn I chose for this piece has a texture that I think would be best replicated by Berroco Comfort DK, if you're looking to duplicate the look and texture of this piece but can't find the yarn. 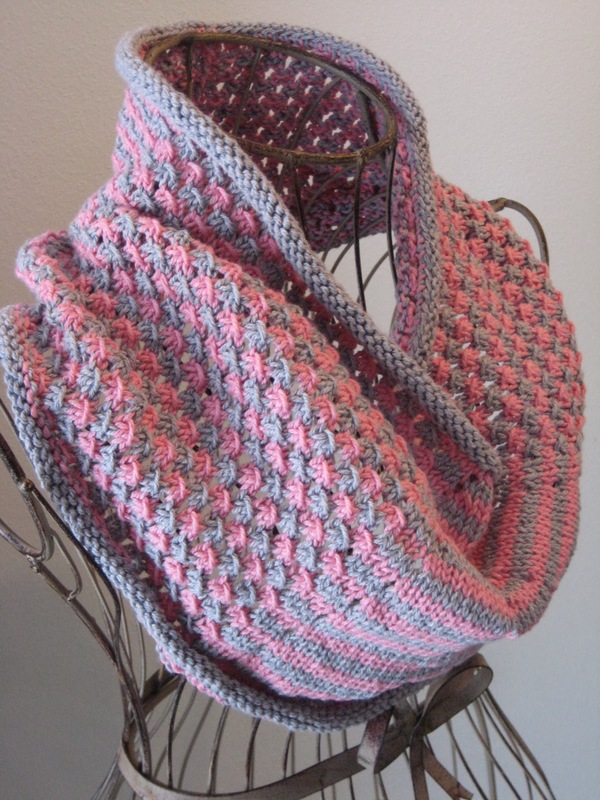 And I'm sure this cowl would also be lovely in any number of cottons, linens, bamboos, acrylics or wools, if the fancy strikes you. Either way, let's get started. Please note: I have updated these instructions as of 2/03/14 for clarity. Using color A, cast on 123 stitches, place marker, and join in round. Purl 4 rows, placing one of your two additional stitch markers after 60 stitches, and your second additional marker after 63 (so these two markers will be three stitches apart, and centered in middle of piece). Slip stitch markers when you come to them during these purl rows. And once they're done, it's time to begin the pattern, which is Two-Color Star Stitch from page 92 of Barbara G. Walker's A Second Treasury of Knitting Patterns. Knit rows 5 - 8 nine times, and then knit rows 5 - 6 once more (if you're getting low on yarn, you can knit less repetitions as desired). If you're offended by the idea of a contrast row of purl stitches in your final band of purl stitches at the end, knit one row in color A. 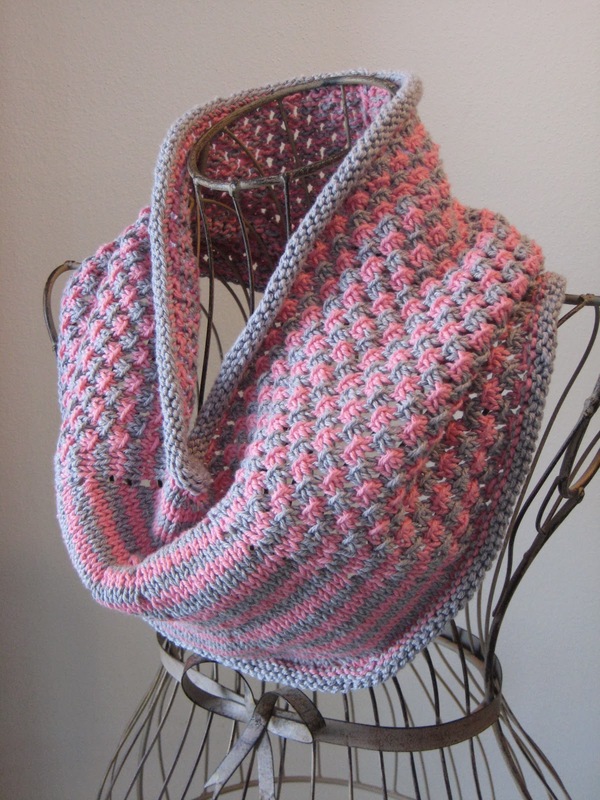 Whether you choose to knit that row or not, finish by purling 4 rows in color A. Bind off loosely. If desired, stitch the cast-on and cast-off edges of the purl bands at the top and bottom of the piece to the wrong side of the piece, stitching them where they naturally curl. Tuck in ends. 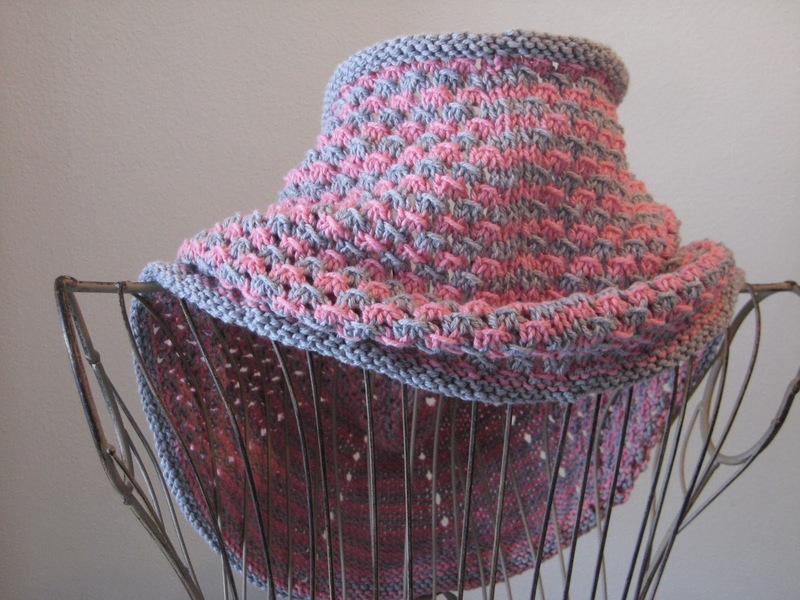 now this pattern is just too beautiful hun, wow, thanks so ever much for sharing this pattern with us, I so so love it. I'm so happy to hear you like it! 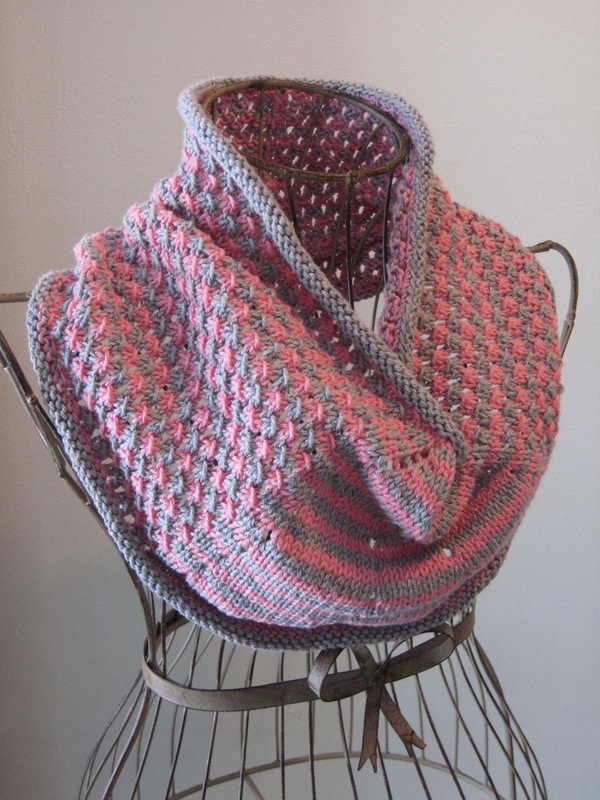 I love the feel of this yarn, and I have to admit I love the pink and grey together too! I'm confused. Cast on 123 stitches. Place first marker at beginning of round. The next after 60 stitches and the 3rd after 63. 60+63=123-so 2 stitch markers are beside each other? Unless there is only supposed to be 3 stitches between SM#2 and SM#3 but that doesn't seem right either. Can you help? You've got it right! There are three stitches between the markers at first, and then you'll work your yarn over eyelets between them to make the stockinette panel of the middle much, much bigger over time (since this piece is knit top-down). Please let me know if you have any more questions! Hi if I m using just one color and in rectangular instead of round what shld the instruction like? Hi May! If you're knitting this one color and flat instead of in the round, then you need to simply ignore all color change instructions (the main pattern is 4 rows long, whether you're doing a color change or not), and work all of the odd pattern rows with a purl stitch instead of a knit stitch (so the odd rows of the pattern will be the wrong side of the work). 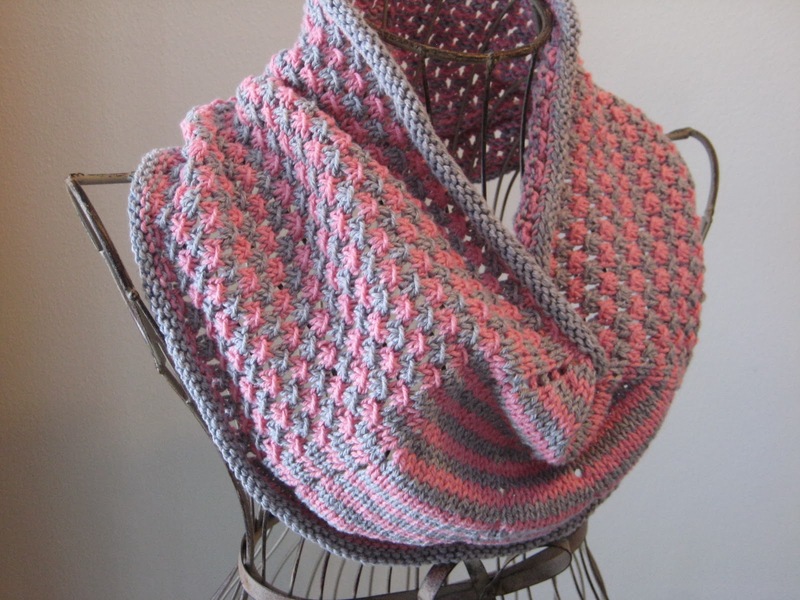 The only other two sections you'll need to be careful about are the four rows of purl stitches at both edges - and since our odd rows are wrong-side rows, you'll just work the edging rows as one knit row, one purled row, one knit row, and a final purl row instead of four purled rows. Oh, and seam it when you're done!!! Is there a pattern for this in the flat? I haven't got the hang of circular needles yet. I'm just starting to learn. I'm 73 but never too old to learn. Baby steps. 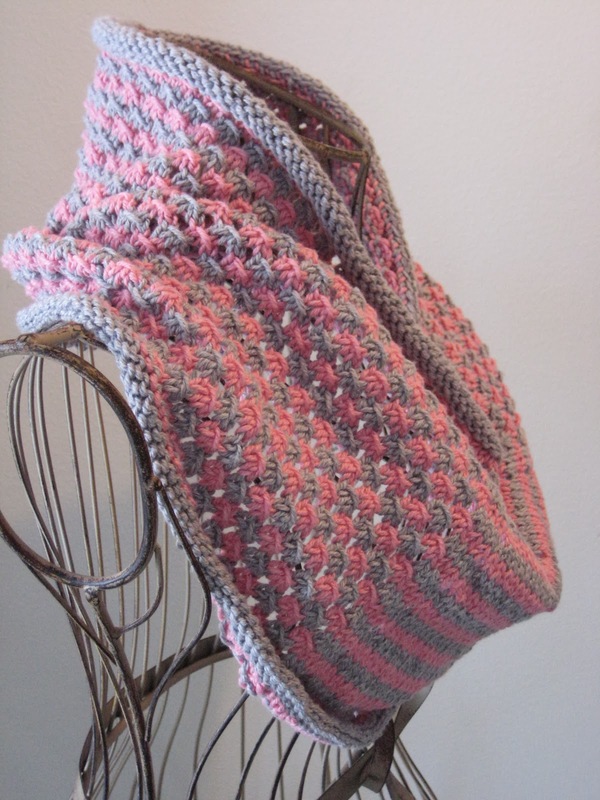 Complete ribbing rows 1 – 4 and bind off loosely. Block and seam. If desired, stitch the cast-on and cast-off edges of the purl bands at the top and bottom of the piece to the wrong side of the piece, stitching them where they naturally curl. Tuck in ends.